You have to be a guest of The Surrey in order to take advantage of their rooftop garden oasis just off museum mile, or a member of the private Patrons Club. 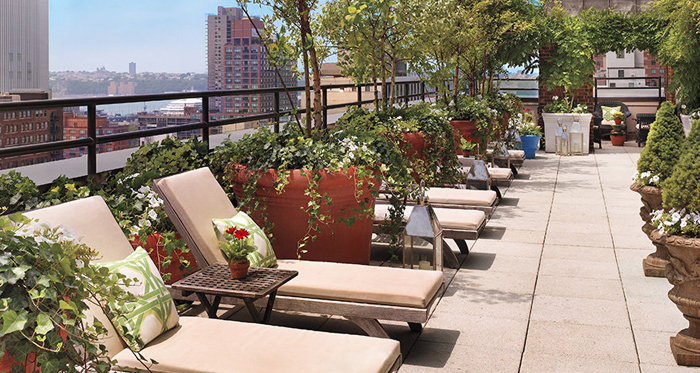 The private garden is flanked by beds of lush greenery and flowers that overlook Central Park to the west. Guests can also complete the serenity with delicacies from the Michelin rated Café Bouloud, or even rent the garden for a private event. 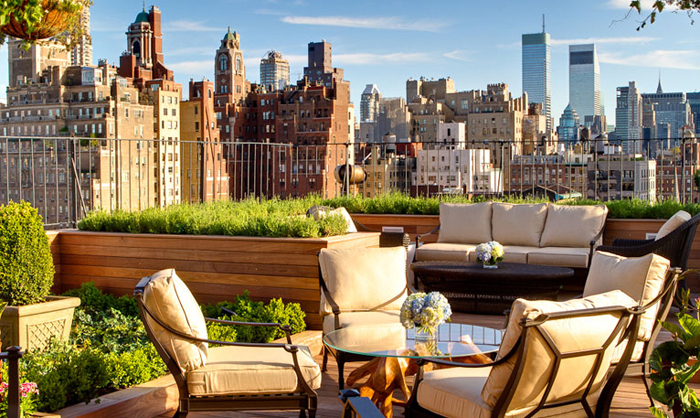 On the top of Madison Park, the lush rooftop at 230 Fifth is so very iconic New York, giving visitors up-close views with the Midtown skyline. 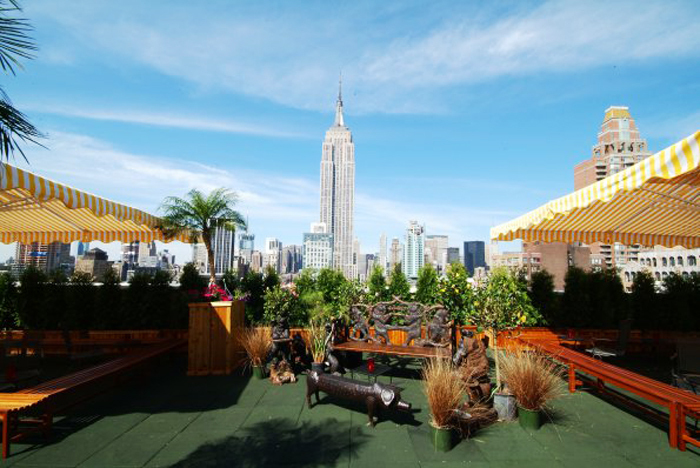 With the Empire State Building front and center, the rooftop accommodates year round. But in warmer months, the foliage comes alive, creating a rooftop respite with greenery, palm trees, and of course cocktails. 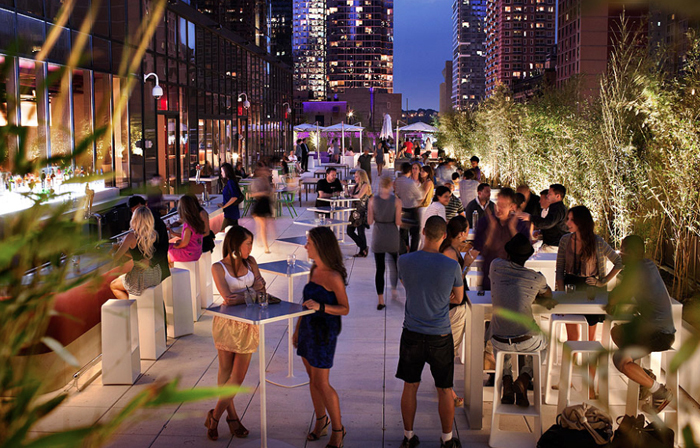 The Terrace at Yotel is just far enough west to not attract the throngs of tourists coming from Times Square. The spacious garden is on the hotel’s fourth floor, giving the unique excitement of being right in the middle of the skyline, rather than above it. Walls of lush bamboo trees flank cozy fire pits for late nights, while also providing shade during sunny days at the hotel’s famous brunch party. Opened for the season on May 20th, the Sky Terrace on the 15th floor of the Hudson Hotel prides itself on its river views right down to the Statue of Liberty. Hanging ivy, trees and potted plants create the perfect atmosphere for enjoying their menu of ten specialty sangrias. The fictional McKittrick Hotel has delighted New Yorkers with its nearly-nightly interactive five floor play, Sleep No More. But beyond the Macbeth experience is Gallow Green, an ivy-filled bar that serves yummy cocktails and bottomless brunches. Like Sleep No More, Gallow Green gives visitors the feeling of discovery, as if stumbling upon a secret garden in the middle of Manhattan. Gallow Green also offers old timey live music and themed fetes that make the view of the Hudson River even more special.